Samsung joins LG in adding Netflix streaming support to two Blu-ray players, the BD-P2550 and BD-P2500, and plans to add Netflix streaming to a "range of home entertainment products." Current owners of Samsung's BD-P2500 and BD-P2550 players can get a free update online at www.samsung.com/bluraysupport. The biggest problem I see with the LG and Samsung Netflix-ready Blu-ray players is that they require a wired Internet connection, while Roku's Netflix Player includes wireless access. A gas main across the street from the call center was punctured by a crew and the fire department evacuated the building for about 45 minutes. No one was injured and there was no harm to the property. We put an emergency notice on the phone so people knew it was an extraordinary occurance and to call back. That's the only time we haven't answered the phones since the call center opened two years ago. Thanks to Steven for sending this in. 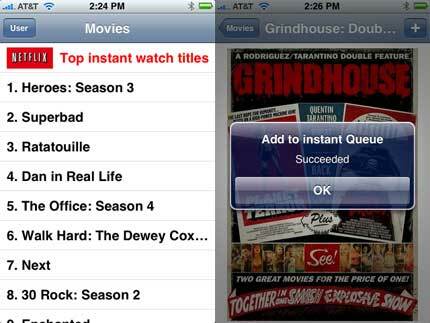 Adrian Crockcroft, a Netflix employee, has written a very useful application for the iPhone called Instant Queue Add. It lets you see the top Instant Watching titles and new releases, and you can add them to your queue while sitting on the couch, very useful if you have Roku's Netflix Player or a Netflix-enabled Blu-ray player. The application is free until October 29th, and then it'll cost 99 cents. Adrian has also been writing about developing software on the iPhone using the Netflix API, if you're into that sort of thing. If you have an iPhone, you can download Instant Queue Add from iTunes. There are a number of iPhone apps for Netflix, and I'll be reviewing them soon (I'm testing them now). 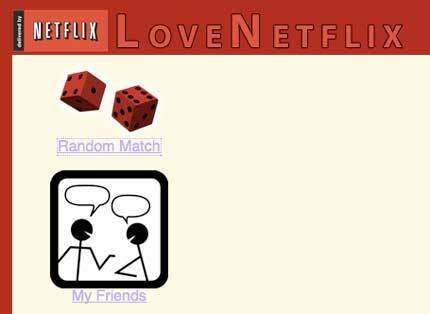 LoveNetflix, currently in beta, is a dating site for Netflix customers. Created using the Netflix API, it's an interesting use of the developer tools. If you see MikeK on LoveNetflix, I was just trying the application so I could write about it. Really. 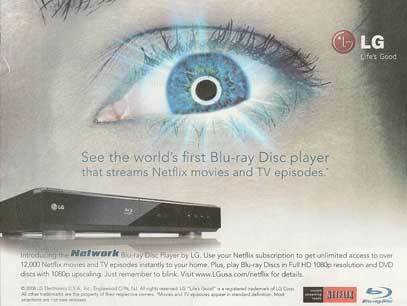 The latest batch of Netflix movies came in envelopes with an ad for LG's BD-300 Blu-ray player, and has the "Instant Streaming Ready" Netflix logo. During the earnings call tonight, Netflix CEO Reed Hastings said that they expect to have 500,000 subscribers paying the $1 surcharge for Blu-ray titles (about 6% of subscribers), and they expect this number to grow as Blu-ray players drop in price. This means Netflix will have more than $6 million on an annual basis to help pay for the more expensive Blu-ray titles. Since I finally bought a Blu-ray player (Sony PS3 for $250 after $150 credit on SonyStyle.com), I wanted to check on Blu-ray availability. I added 100 random Blu-ray titles and I was surprised that only 3 were on "short" or "long wait" (You Don't Mess With the Zohan, Leatherheads, and American Gangster). Since I just signed up for Blu-ray, I'm wondering if more titles are available, and if this number will change as I rent more Blu-ray discs. How would you rate Netflix's Blu-ray availability? Netflix posted Q3 2008 results, and as Netflix warned results were lower than expected. Netflix ended Q3 with more than 8.6 million subscribers, up 23% over last year and 3% over Q2. Revenue was $341 million, up 16% over last year and 1% over Q2. Gross margin increased slightly to 34.2%. GAAP net income was $20.4 million, up 30% over Q3 2007. Subscriber acquisition cost was $32.21, down from $37.89 during Q3 2007, and up from $28.89 for Q2 2008. Churn was 4.2%, the same as Q3 2007 and Q2 2008. It looks like Netflix is not recession-proof, but is still able to grow during troubled economic times. 8.8 to 9.15 million subscribers in Q4, and 8.85 to 9.15 million for the year. Revenue of $351 - $357 million for Q4, and $1.356 - $1.362 billion for 2008. GAAP net income of $18 - $23 million, and $78.3 - $83.3 million for the year. Seeking Alpha has posted a transcript of the earnings webcast. Netflix CEO Says Macintosh Streaming "Details Shortly"
On the earnings webcast this evening Netflix CEO Reed Hastings said that the 2nd generation Netflix streaming player software will support Windows and Intel Macs, and they will be "announcing details shortly." Netflix is expected to use Microsoft's Silverlight technology to support the Macintosh and the Firefox browser. The timing is right: last week Microsoft launched Silverlight 2, and Netflix demonstrated a Silverlight version of the player in May 2007. 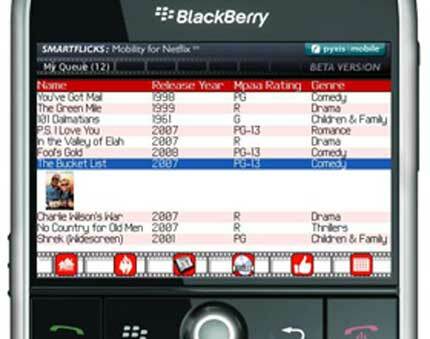 Pyxis Mobile has announced the beta of SmartFlicks, a Netflix application for the BlackBerry developed using the Netflix API. I don't have a BlackBerry, but the company says that SmartFlicks will enable you to manage your Netflix account, your queue, and access movie news. The official word from Netflix about gift codes: "Netflix discourages the purchase of Netflix gift subs on any third-party sites. It’s a violation of Netflix Gift Subscription Terms to resell Netflix gift subscriptions anywhere."